Note: I realize I have not posted anything in several months—in fact, I feel a little guilty about that. I have been working on a book about Cold Spring Harbor for Arcadia’s Images of America series and that has taken much of my time. The following is a result of some of the research for that book and also research done by Luke Berlinghof of Cold Spring Harbor High School. It’s too long for the book, so I thought I would share it here. George Hawxhurst was an elderly blind man who lived at the Industrial Home for the Blind from soon after it first opened in 1951 on the 32½-acre former Walter Jennings estate, Burrwood, in Lloyd Harbor, until he died at the age of 83 in 1976. He had no known relatives, no money, and was destined to be buried in an unmarked grave in the paupers’ section of a local cemetery. But the director of the Home and other staff members remembered that he was from an old Cold Spring Harbor family and that the family had a cemetery on the hill south of Cold Spring Harbor’s Main Street. Neighbors of the cemetery objected. There hadn’t been a burial in the cemetery in a quarter century, certainly not since the surrounding property had been subdivided and new homes built nearby in the late 1960s. It would be unsettling for the children who now lived in the neighborhood. The Town Board, which had control of the cemetery, overrode those objections and agreed that Mr. Hawxhurst should be buried with his family. Who was his family? It turns out that Mr. Hawxhurst descended from some of the earliest settlers of Cold Spring Harbor, many of whom, like the cemetery in which they are buried, are now forgotten. One of the earliest settlers of Cold Spring Harbor was the Rudyard family. The Rudyard homestead sat at the northwest corner of Main Street and Goose Hill Road and is said to date to the seventeenth century (it survived until 1901-02). Who the earliest Rudyards in Cold Spring Harbor were has not been determined yet. But a later member of the family, Captain John Rudyard, married Martha Conklin in 1741 in Huntington. Their children were baptized in Oyster Bay, which is also where he owned land, so he may have lived there. Their son John, however, was a carpenter in Cold Spring Harbor. He married Catherine Doty, from another old Cold Spring Harbor family. Martha C. Rudyard, one of Captain John Rudyard’s granddaughters, married Walter Jones in 1819. This Jones, however, is not of the whaling company Jones family. That family descended from Major Thomas Jones who settled in Oyster Bay by way of Rhode Island. This Walter Jones was the great grandson of a Jones who came to Cold Spring Harbor directly from Wales. There was a Thomas Jones who settled in Huntington in the seventeenth century. A record of his widow conveying land to their children in 1681 can be found in the Huntington Town Records (Vol. 1, page 301). The progenitor of the whaling family did not arrive on Long Island until 1695. Martha and Walter Jones had at least six children. Their son Walter Jackson Jones became a sea captain. He was not involved in whaling, but with his brother Edmund sailed to Australia, China, and Japan as well as other foreign ports. He also had oyster beds and provided a barrel of the shellfish to David Bennett Hill, the Governor of New York from 1885 to 1891. Walter Jackson Jones never married. He lived with is unmarried sister, Sarah Ann, in the old family house which was located where the Cold Spring Harbor municipal parking now is. They were considered an eccentric couple. The house was rundown: chickens would roost on the sills of the open windows. Sarah Ann died in 1903. Walter Jackson died in 1916. Jennie Hawxhurst reported that she was a dressmaker working from home for the 1920 census. In 1930, she reported housework as her occupation. In 1940, when she was 69, she reported no occupation. The next year, it was reported that a real estate developer had purchased the 7½-acre estate of Jane Seaman, including the homestead with plans to subdivide it into half-acre lots. However, when Jennie Hawxhurst died in 1953, she bequeathed the house to the Industrial Home for the Blind, where her son was then living. The Home for the Blind owned the property in 1960. She died at the Hillcrest Nursing Home in Northport. Eventually, the old Jones homestead property was sold to others and then in 1960 it was taken by the Town of Huntington by eminent domain to build a much needed parking lot for Cold Spring Harbor. 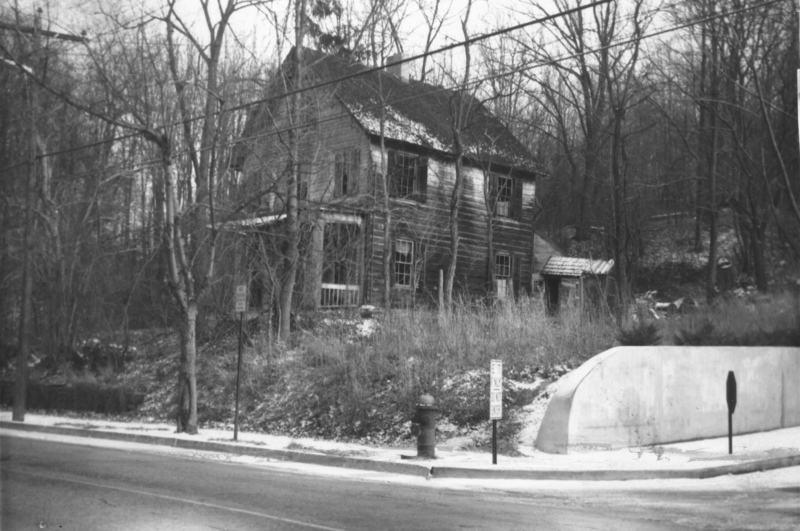 The Seaman home was torn down to build the new post office building in 1962. Fourteen years later, someone remembered well enough to secure George a place in the cemetery—the last of his family to be buried in the old family cemetery behind the long gone family homestead. Nice bit of research, as usual. Keep ’em coming.